The key to a great firepit is in the elements. In this article, we’ll tackle the 3 elements which will ensure you’ll have a great firepit installed. Choose the right surface material for your firepit. It can be brick, concrete, pavers, or flagstone. It can either use the same material as your patio surface or provide a great contrast and be a shining beacon to serve as your patio focal point. Whichever material you decide to use, make sure it’s sturdy enough to handle the heat and other weather elements that will come its way, especially when it’s on an open patio like this lone star-themed firepit. Know which type of firepit suits your needs. Should you install a gas-fuelled firepit or a propane one? Can you go the extra mile and use fire glass instead? Discuss the options with your contractor to know which best suits your budget and style. If you’re going for a dual purpose firepit, that might also affect the type of firepit you will install. Determine other purposes for your firepit and pick the right one which can serve you more than just providing warmth. Complete the whole firepit experience with a comfortable lounge area. Make lounging around your firepit more comfortable with the proper seating furniture installed. Whether it’s a rustic stone bench, a dining set, sectional sofas on the deck or even simple stools and a couple of hammocks, get ready to nestle in your firepit deck and spend hours just enjoying the scenery. To find out more about firepits, head over to our firepit page or call us today for a personal, no-obligation consultation. Discuss your ideas with us and let’s see how we can bring your dream firepit roaring into reality! Borders have an easy way of creating neat divisions for plants and pathways in your outdoors. In this article, we’ll show you to easily carve your curb appeal through borders. Boosting curb appeal, highlighting flower patches and defining the pathway: these are just three functions these borders accomplish for the home. Setting a defined space for your flowering plants avoids its encroachment on the pathway while also giving ample space for the walkway. Made with select pieces of small boulders, this rustic border easily blends with the garden plot and works as if it was there since day 1. Landscaping a yard can be an overwhelming task but when done in planting groups and yard sections, a homeowner will be able to fit all the small details one wants and still get a landscape that’s easy to maintain. For this border project, one can easily see the plant groupings. Each section has its own focal point with complementing plant varieties. Border create a stark contrast to the landscape color scheme while the undulating perimeter garden add curves to an otherwise boxed in outdoor space. If you want to introduce curves and uniquely shaped landscape sections to your yard, it’s best done with borders! Another curb appeal improvement brought to you by borders, these raised flowerbeds garner more attention with their defining borders. The thematic borders do a great job of keeping the plants growth fenced in while being secured from trampling. Notice how the border continues the façade aesthetics which easily ties in the flowerbeds and landscaping to the home exteriors, giving it a well-manicured look. Keep your green lawn and landscape plantings co-existing in harmony without fierce competition when it comes to getting their fair share of soil nutrients by adding a border. This allows your landscape elements to grow and thrive in harmony without encroaching on the other elements and gives your yard a neat and organized look! Wondering what possibilities can you achieve with your pergola? Here are 5 pergola pegs which you can work after and unleash its charming effect on the overall look of your home. Instead of the side roof that splits your home into two discernible layers, a pergola serves you better with it being a focal point which bestows charm on an otherwise plain wall. Aside from its charm, enjoy a partially obstructing pergola which bestows adequate light on your pathways. With its ribs or lintels, you can have an array of hanging plants, orchids or even idyllic vines. Mimic the long lost open courtyards of Rome with well-manicured vines growing semi-wildly and conquering your outdoors with its wild charms. Keep the airy feel of your outdoor space with a pergola which easily fulfills its role as a roofing material. Aside from costing less, a pergola comes across as both homey and edgy enough without looking clunky in your yard. If you don’t like the oppressive feel of a garage to store your car, a pergola can house it without triggering your claustrophobia. Flexible enough to be extended, a pergola’s natural design makes itself pleasing to the eye. Aside from a charming patio cover, a pergola also serves as a nifty walkway arch. With its sides used as stilts for lovely climbing vines, a pergola uplifts the architectural statement within your yard and in extension, your overall real estate value. 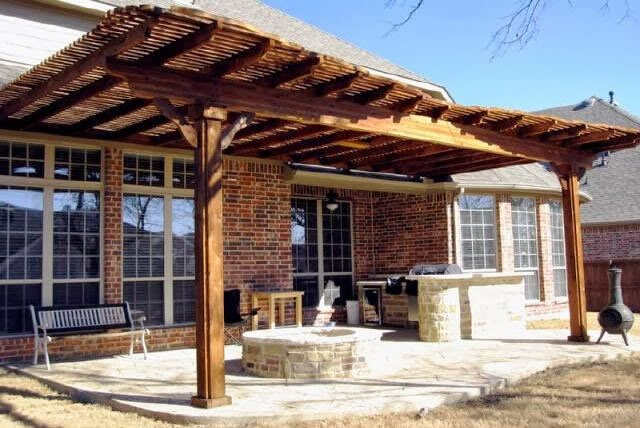 Maximize your yard potential with a pergola that easily fits your space. Whether it’s a garage, a side roof or welcome arch, a pergola is a great architectural feature to incorporate in your yard. If you’re still unsure on how a pergola can fit in your yard, schedule for a free in-home consultation today! Bump up your outdoor style with a low-key budget for 2018. In this entry, we’ll show you how to achieve a high-end look for your outdoors without breaking the bank. Read on and find out thrifty ways to decorate outdoors this 2018. It does not need to be a grand fireplace to provide ample warmth for your outdoor gatherings. A small firepit placed in the prime spot is all you need to have your outdoor place heated. To save space, you can have it built into your wall, or even in the center of your outdoor table. Ramp up your real estate value by turning your simple patio into a fully-functional outdoor room in 2018. Bring some spare comfortable living room furniture outdoor and fit it up with plush pillows for an instant and inviting outdoor living room. Enjoy a smoother walk or drive through your pathway by having it fully concretized. Smooth patio surfaces will smoothly sashay into vogue this 2018. And it stands to reason why concrete will reign supreme since this patio surface is beyond durable, affordable and versatile enough to accommodate any color palette you’re working with for your home’s exteriors. For those who love unwinding in a pool, this is the year to finally install that pool of yours. And forget about protesting about how small your outdoor space is. Thing is, the smaller your pool is, the more attractive and intimate it looks. Think that one-person sauna or bath you usually see in magazine spreads. This year, this exclusive luxury will proliferate in American homes. This 2018, it’s all about having durable installations for your outdoors. And it includes ample seating area. Expect different seat designs popping up from simple ledge seats to molded concrete in funky shapes and sizes.